Journey back with us to the good old days when melody was king. Hear the stories and songs of such legendary songwriters as George and Ira Gershwin, Irving Berlin, Jerome Kern, Vincent Youmans and Irving Caesar. From “Always” to “You Made Me Love You”, these unforgettable tunes are still enchanting today. Can’t get to New York? Then join us for an exciting concert of the latest songs from Broadway hits. Through story and song, we’ll highlight the latest and greatest musical numbers currently gracing the Great White Way. Our talented performers will musically transport you to the Best of Broadway— at a fraction of the New York ticket cost! The 40’s kicked off Broadway’s Golden Age, ushering in a new way to entertain audiences through integrating music, drama and dance. 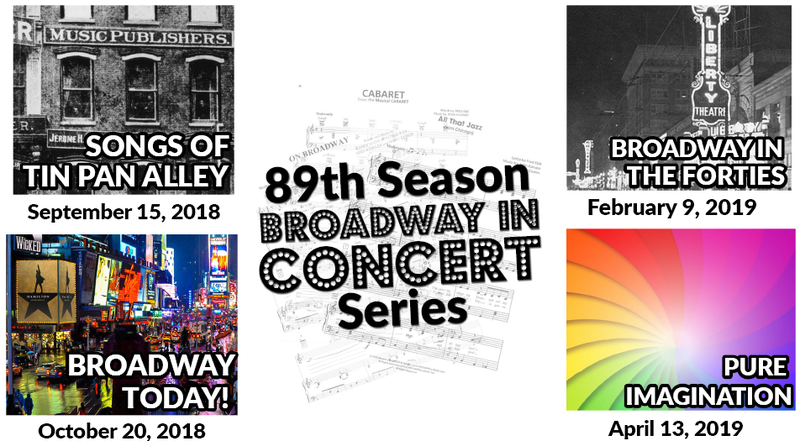 Shows included in this panorama are Pal Joey, Lady In The Dark, By Jupiter, Oklahoma!, South Pacific, Allegro, Annie Get Your Gun, Kiss Me Kate, Bloomer Girl, Gentlemen Prefer Blondes, Brigadoon and many more! A concert for the kid in all of us, where we celebrate the great classic tunes created for family entertainment. Singalong to Snow White, Mary Poppins, Willy Wonka, Chitty Chitty Bang Bang, Hans Christian Andersen, Lady and the Tramp, Toy Story, Beauty and The Beast . “Step in Time” to get your tickets for this fun filled musical celebration!